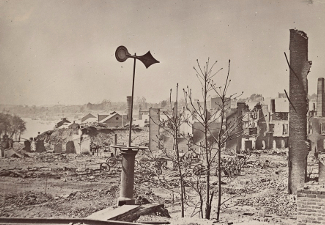 Richmond and the destruction of 90% of the downtown after the fires set by fleeing Confederate troops. Parking Fee at American Civil War Center - Tredegar Iron Works. Various individual sites charge fee. Virginia State Capitol Building in Capitol Square, Richmond. Historic Tredegar Iron Works, munitions factory for the Confederate Army, now the National Park Visitor Center. Modern buildings lit up with images of the fires that burned the city in 1865, walks by various organizations up and down the streets following Lincoln's path or the trail of slaves, tours of the capitol building, ceremonies with spiritual songs and talks by a Governor, plus tents of remembrance and history and lore. For four days from the first of April, Richmond, in one sense, celebrated its downfall, as Confederate capitol at least, and its rebirth as part of a reborn republic. And the events for visitor and resident alike were both cathartic and thrilling. When Confederate President Jefferson Davis recieved word in St. Paul's Episcopal Church (photo below) that General Lee could not hold Petersburg and urged evacuation of Richmond as it was next to fall, it sent a spiral of activity that saw Richmond burn (an unintended consequence of Confederate troops trying to destroy munitions and supplies, but not the whole downtown), troops scatter west toward their rallying point at Amelia Court House, and the influx of Federal troops, including colored brigades, plus a tall man in a hat to walk the footsteps of what had been, for four arduous years, the center of the south's attempt to secede. These days were final proof, that although it would take another week to cement that idea, the Confederacy would be done. What would become of the capital? Would the realization that freedom now truly meant that slaves, bound, chained, and sold along the wharfs of the city of Richmond for centuries really lead to peace and tranquity and a society where class did not matter? Well, while the answer to those questions may still be in flux one hundred fifty years later, as you walked through the streets and listened to the accounts of the history there 150 years hence, you kept thinking that the answers were becoming clearer. No, not yet clear, but a whole lot clearer than in the days of the slave trade, war, and secession. President Lincoln now walked from the bowels of the city past the houses that held those auctions, which you could follow with guided narration. He would climb into the seat of Jefferson Davis at the Confederate White House, perhaps not for pique, but rest, and know that the four years, now compressed into the Union Army recapturing Richmond after nine months of siege, would lead to even greater surrender. 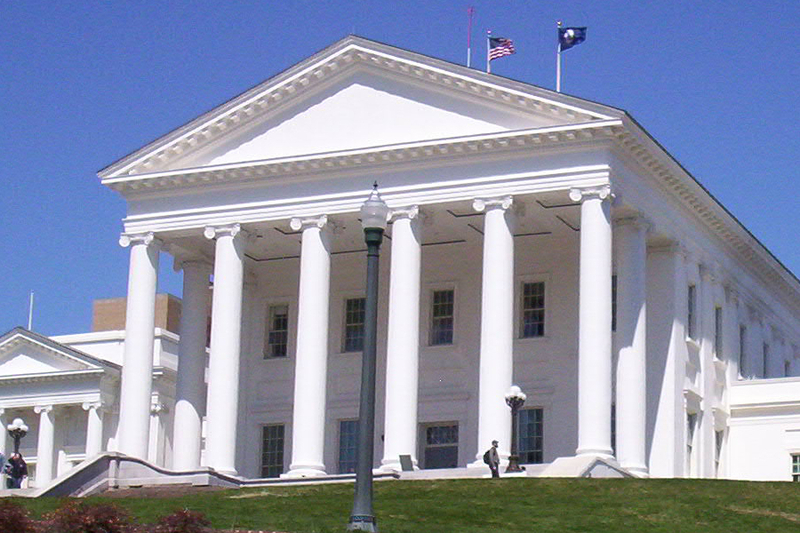 The Virginia Capitol- Was a center of activity for Confederate causes as it served as the Confederate Capitol building from 1861-5. Abraham Lincoln would tour the building during his footsteps in the capital the week of the Confederate evacuation. Its history, however, goes even further back, when it was established to house the Virginia General Assembly, the first legislated body in the western hemisphere, known as the House of Burgesses, in 1619. This building itself was built in 1788. The Slave Trade- Until the time of the American Revolution, slaves were brought from Africa up the James River to be auctioned in the houses that dotted the riverbank streets. The practice of import was halted by legislation in 1778, but did not stop the sale of slaves to southern plantations within the United States. Lumpkin's Jail was just one of the houses that served as lodging for slave traders, a holding facility for slaves, and auction house. 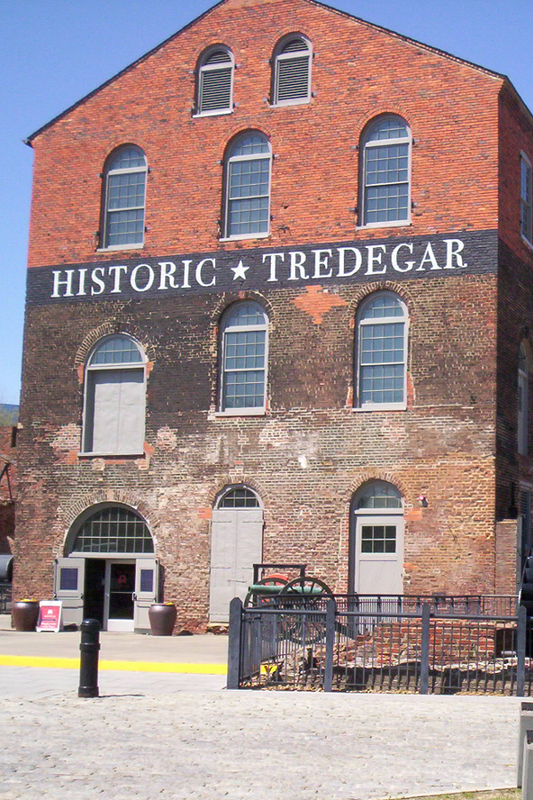 Tredegar Iron Works - Begun in 1836, the site is now the home to the Visitor Center for the National Park, which has several sites spread throughout the city to visit. The iron works were used during the Civil War to make cannons and other munitions fot the Confederate army. Beside the iron works today, the American Civil War Center sits, which can be visited for an additional fee. Down along the river, you can also walk over a pedestrian bridge to the site of the Prison of War camp at Belle Isle, where 30,000 Union prisoners were kept. The park has many additional units outside the center of the city where battles of the siege timeframe and Seven Days Battles of 1862 took place, including Cold Harbor, Fort Harrison, and Malvern Hill. The Slave Trail - The Slave Trail now takes visitors from its embarkation point on the south side of the James River (parking at Manchester Docks) and winds along the south side to a crossing at Mayo's bridge. Once on the city side of the river, you can witness the sites of auction houses, Lumpkin's Jail (see below), the African burial ground, and the First African Baptist Church. 1. For us, the walking in the Footsteps of Abraham Lincoln tour let you feel the weight of the moment. 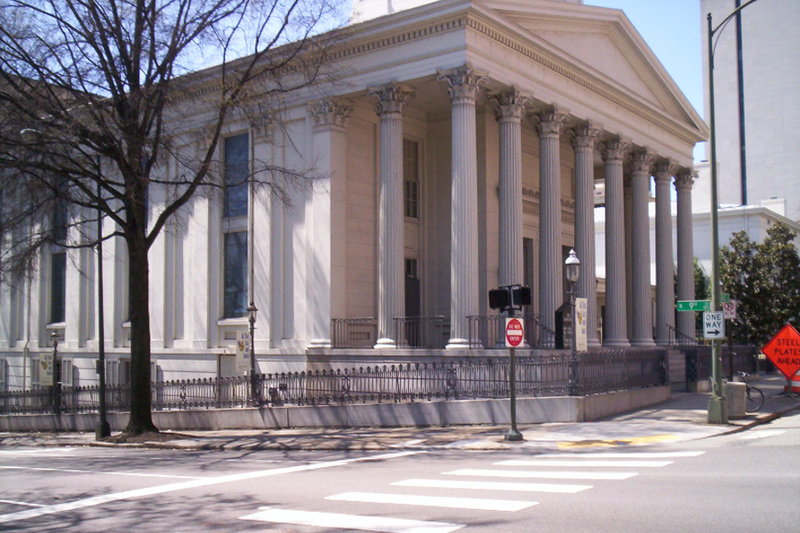 From the canal near slave houses, Lincoln stepped off his boat, without much guard, and climbed the streets of Richmond to the Confederate White House, sat in the chair of Jefferson Davis, and contiuned to the capitol. Although a bit noisy due to the busy streets of current Richmond, you got a great sense of the moment. One of the odd additional thoughts that occured to us was just how the devastation of the fire changed Richmond forever. I guess this is for good, but all those modern buildings would not have been possible without the degradation. Good? Not? But it is predominantly true. 2. The Commemorative Procession and Ceremony. 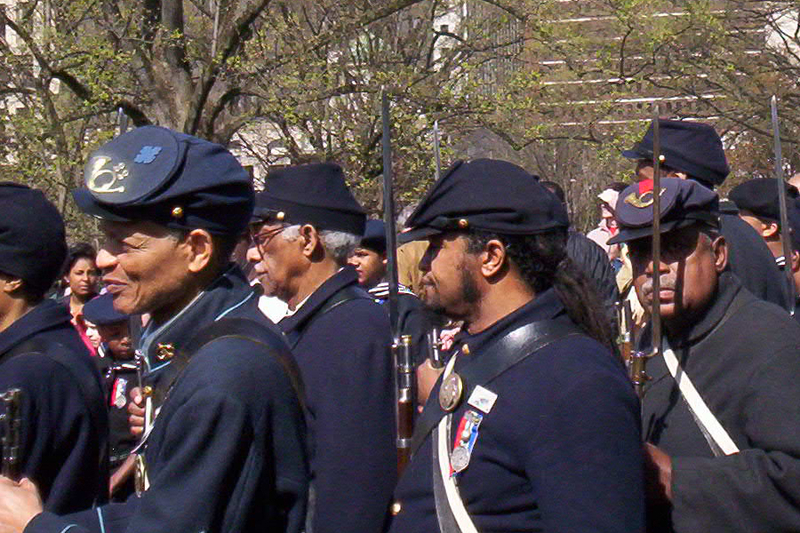 Reenactors from the United States Colored Troops, plus others, walked into Capitol Square, past the George Washington statue, and to the ceremony site. We enjoyed the sight of the procession more than the ceremony itself, probably due to our location, but the symbolism of those troops reenacting their walk into the city one hundred and fifty years before just topped those two moments for us. 3. The surprise of making a wrong turn. On an afternoon tour by the National Park Service to learn about the civilian experience at this time in history, we got lost when trying to assist a fellow visitor. 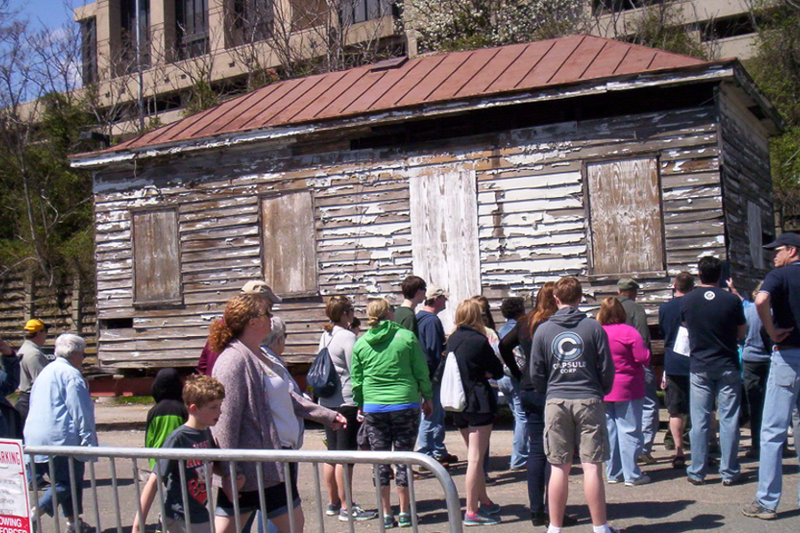 Attempting to reconnect with the group, there was diversion to another tour, this one taking us to the site of the slave trade, burial ground, and Lumpkin's Jail (photo below). So we got a highlight we didn't expect. Later we found the original tour. St. Paul's Episcopal Church, Richmond. Church where the message from General Lee reached Confederate President Jefferson Davis telling him that Petersburg had fallen and that he should evacuate Richmond. 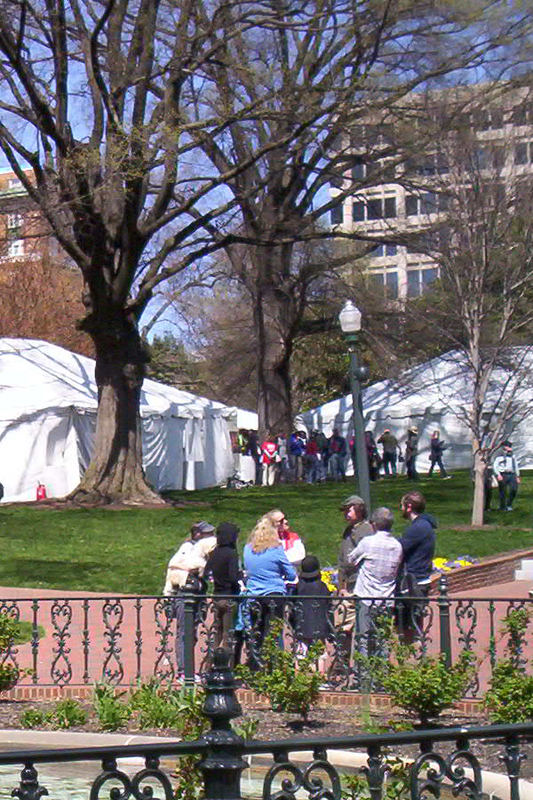 Speaker's Tents during the 150th Anniversary Celebrations in Capitol Square, Richmond, April 1-4, 2015. Even if you missed the special events of the 150th anniversary at Richmond, Petersburg, or Appomattox, you can still create your own. The national parks and other historic sites of Richmond, Petersburg, and Appomattox are still there for your enjoyment and history every year. And on their anniversary dates each year, there are usually additional walks and talks at the various sites than on a regular day. We know some don't like to go when crowds are up, but it does add a bit to the excitement and you do, most times, get to go on extra tours. If you're going on any of the three main sites of the Richmond to Appomattox end of the war trail, don't forget the other sites from Lee's Retreat. There are dozens of wayside markers and audio explanations (stop and turn your radio to the appropriate station to hear them). Two main sites you should visit that are way past the waystation level are the newish Battle of Sailor's Creek State Park and High Bridge State Park. Sailor's Creek was a battle midway between Richmond and Appomattox that in many ways sealed the fate of Lee that would be cemented three days later at Appomattox. High Bridge will show you just how high a bridge can be, and how difficult it would be to cross that river and swamp if you couldn't use the bridge. Confederate attempts were unsuccessful and allowed the Union to follow close behind. Photo above: Lumpkin's Jail along the Slave Trail. 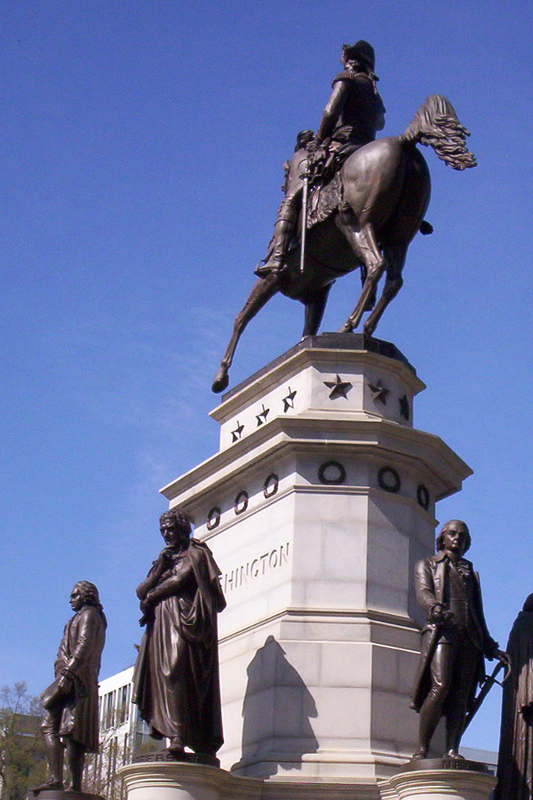 Washington's Equestrian Statue in Capitol Square, Richmond, Virginia.